When Lailie Victoria Ruiz-Toledo was born, she weighed 13 ounces. Her hand was so tiny, a wedding ring could fit over her arm. 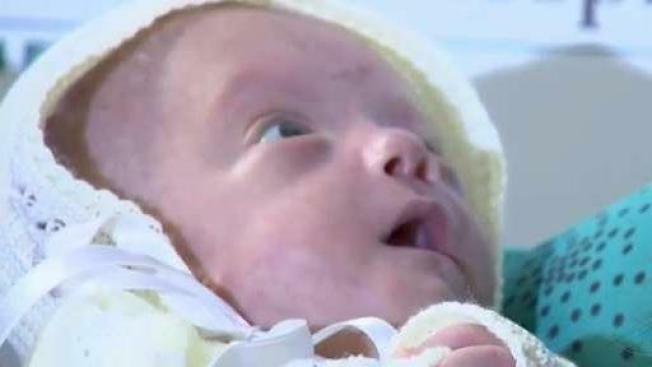 Doctors called her a “miracle baby” -- infants born under 14 ounces rarely survive in any hospital, according to Dr. Andrew Kairalla, chief of pediatrics at the neonatal intensive care unit (NICU) at Baptist Children’s Hospital in Miami. Baby Lailie was delivered at the hospital on Aug. 12, 2017. After four months in the NICU, Lailie -- now a solid 5.1 pounds -- went home on Dec. 29 to spend the New Year with her family. “She’s been through a lot, but she’s a fighter,” said Jaksiri Ruiz-Toledo, Lailie’s mother. Lailie endured serious complications through birth, but her mother never lost faith. Ruiz-Toledo was originally expecting twins, but lost one and went through a high risk pregnancy. In August, she gave birth to Lailie. Baptist Children’s Hospital says Lailie is one of the tiniest babies to beat the odds. Both Jaksiri and Lailie’s father, Marcos Ruiz-Toledo, are grateful to have their baby home for the New Year. “Holding her like this from the tiny thing I couldn't even feel in my chest.. it's an amazing feeling,” Jaksiri said.